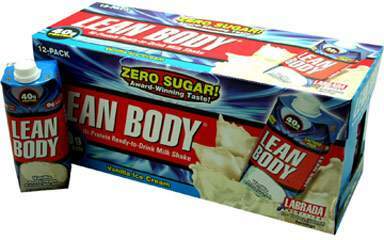 The new Lean Body 17 oz. Ready-to-Drink shake is the perfect nutritional boost for those on the go! Each 17oz. TretraPak serving packs in 40 grams of lean muscle-building protein, and with 0 grams of sugar, it's ideal for any carb-restricted diet. Lean Body. It's the delicious, convenient way to enjoy your nutrition on the go! No Artificial Color, Flavor or Sweetener, No Preservatives, No Sugar, No Starch, No Milk, No Lactose, No Gluten, No Wheat, No Yeast.